1) Put a blank schedule online. 2) Call for session proposals before your THATCamp begins. 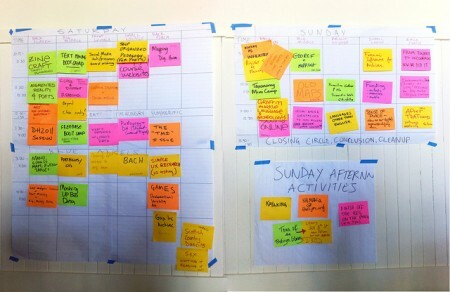 3) Count the time slots and the session proposals. 4) If you have more proposals than time slots, solicit votes on sessions from your participants. 5) Assign someone to create a draft schedule. 6) Discuss and revise the draft schedule with the participants. 7) Proceed with your unconference. Publish the Google Doc spreadsheet by going to “File > Publish to the web > Start Publishing”. Then, in the section labeled “Get a link to the published data,” select “HTML to embed in a web page” from the dropdown box. Go to the Schedule page on your website and paste that into the WordPress page using the “Text” (formerly “HTML”) tab. Note that in most THATCamp websites you can make more room for your schedule by setting the page template to a one-column template with no sidebar — while editing your Schedule page in WordPress, look for a dropdown box labeled “Template” on the left, then choose the one-column template. You can adjust the height and width of the embedded spreadsheet by increasing or decreasing the values for “height” and “width” in the HTML code. You can also create a blank schedule in a simple list on your THATCamp website with both time slots and room numbers listed, or in an HTML table. The first session of the first day should be the scheduling session. The ideal amount of time for this is 90 minutes, which leaves plenty of time for creating, discussing, and revising the schedule. One hour is minimum. Voting should mostly take place before the scheduling session begins, during unscheduled check-in and coffee-drinking time. It’s always a good idea to schedule wrap-up sessions of at least fifteen minutes for all participants at the end of every day. People need closure. Organizers may also need to make logistical announcements about road conditions, food, social events, and the like. Same goes for introductory sessions at the start of each day. Even at an unconference, some of the best conversations take place in the hallway. Leave time between sessions: at least ten minutes, or fifteen, or even thirty. Scheduled “free play” sessions are also a good idea—sessions where people can try out new technologies they’ve learned in a hands-on way, and/or continue discussions they’ve had in the sessions. It’s fine to pre-schedule a few workshops or presentations as long as there’s plenty of time for unconferencing. Much more on this on the separate session proposals page. Just be sure to call for proposals from your THATCamp participants at least a week or two before your THATCamp begins, or to arrange a dedicated brainstorming period of at least an hour at the start of your THATCamp. If you have 24 time slots available for sessions (e.g., four 75-minute time periods multiplied by six rooms) and 30 session proposals, you’ll need to ask participants to vote on which sessions they most want to attend. Even if you have only 20 session proposals, it’s still a good idea to ask participants to vote, since that will give you a good idea of how large a room is needed for each session. More popular sessions can be assigned to larger rooms. On the first morning of your THATCamp, you’ll want to set aside 60-90 minutes for session voting. Make sure everyone gets a chance to vote; you’ll want to emphasize (in an email or on your website) how important this first session will be, in order to maximize attendance. We’ve seen two major models for the voting process. Before your THATCamp begins, draw a blank grid (or list) on your whiteboard, chalkboard, or empty piece of paper with the same number of cells (spaces) as your schedule grid. As people are gathering, ask them to write a word or two describing their idea for a session in one of the cells (or on a Post-It note that they can put on a cell). Make sure they include their own names, as session proposers will need to facilitate their sessions. Then everyone should put a hash mark or other indication of interest (the foil “Good Job” stars you can buy at Staples work well) beside sessions they are interested in attending. Some have asked why we don’t enable online voting on session proposals. We have considered it, and may do so in the future, but the chief reason we haven’t made it a priority is that the in-person method works well and is fun. Not everyone will be willing to read all the session proposals on the blog and comment of vote on them before they arrive at the THATCamp, whereas once they arrive at THATCamp, just about everyone is willing to wander around with a cup of coffee reading session titles and pasting stickers on pieces of paper. If you have enough time in the scheduling session, you might also choose to have everyone who proposed a session stand up and say a few words about it, then gauge votes by a show of hands instead of by stickers. This method also works if you haven’t gotten many proposals. If you have only a few session proposals, say 10 proposals for a 24-slot schedule, you can also use the scheduling session for brainstorming. 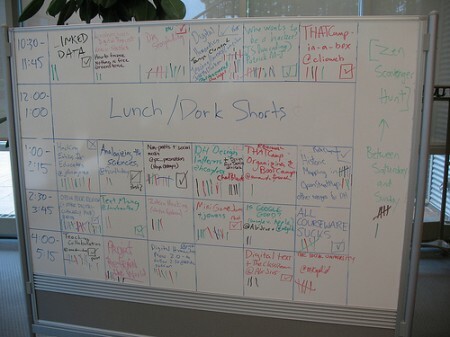 After the votes have been cast, and while participants are enjoying coffee or breakfast or listening to introductory remarks or Dork Shorts, one or two organizers should tally up the votes and create a draft schedule by entering session titles and facilitator names into the blank schedule. While most of the decisions will have been made through the democratic process of voting, the people making the draft schedule do also have some monarchic power to edit the results in order to make the schedule run smoothly. Session proposals that are of little interest to participants can be combined with other, related sessions, or eliminated altogether. Sessions can be put in “tracks” so that sessions on related topics happen serially rather than at the same time. Just be sure to explain what you’ve done when you bring the draft schedule back to the people. Obviously, sessions with the most votes should be put into the largest rooms, and, if possible and desirable, into different time slots. Be sure to enter the name of the person who proposed the session along with the session title; that person should be aware that they will need to act as facilitator. The schedule should be left up on a prominent screen so that participants can refer to it as they begin the day. Once you, or your designated schedule-maker, have filled out the schedule with suggested sessions, return to your participants, project the finished schedule, and solicit their opinions. Do the session timings make sense? Has anybody proposed a session and then had it scheduled after they need to leave? Do any topics conflict that shouldn’t? Would anyone like to propose anything at the last minute? Are all the facilitators present? If not, would anyone else like to volunteer to run that session? Revise the schedule accordingly. It’s a good idea to print the finished schedule and hand it out to participants, as well as to post it outside session rooms. You can also keep the schedule up on a central monitor, and most schedules should be roughly readable on mobile devices. Then have a great unconference!